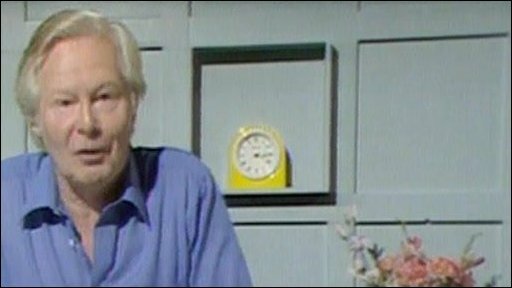 Artist and children's presenter Tony Hart has died, aged 83. Hart, who lived in Surrey, had suffered from health problems for a number of years, including two strokes. His family said he died peacefully. The affable presenter inspired children to paint and draw on shows like Vision On, Take Hart and Hartbeat for nearly 50 years before he retired in 2001. Fellow artist Rolf Harris led tributes, calling Hart "a very gentle and talented guy". "He enthused and inspired a whole generation of kids into creating their own works of art, simple or complex." Hart's agent, Roc Renals, said the presenter had died in the early hours of Sunday morning. He said: "I was for many years his best friend, agent, manager and publicist. He suffered two strokes many years ago and his health declined since then." "Thousands and thousands of young people who are now grown up will thank him for inspiring them to take up art," he added. Wilf Lunn, Hart's friend who worked with him on Vision On for nine years, said he was a television pioneer. "His legacy was the fact he really started all these children's programmes, Art Attack and all that, and he was the guy, right at the beginning. "And he was the guy who had all these little tricks that teachers used to use because they make things look easy, and we got people into doing it. And he was such a nice man." The artist served as an officer in the 1st Gurkha Rifles in World War II, before joining a course at Maidstone College of Art. Gurkha Welfare Trust director Colonel William Shuttlewood said Hart regularly donated pictures which were auctioned and raised "substantial" amounts of money. He said: "I am sorry he has gone. He was a lovely chap and was very keen to make sure we were supported properly." It was a chance meeting in 1952 with a BBC TV producer and a demonstration of his quick art skills on a paper napkin that secured his on-screen career. 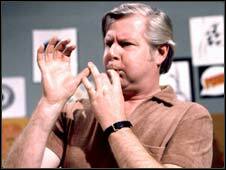 Hart became resident artist on the Saturday Special programme that year. Subsequent TV shows included Playbox, Titch and Quackers, Vision On, Take Hart, Hartbeat and Smart Hart. From 1977 he appeared with animated clay character Morph, who lived in a pencil box. Morph was later joined by his cream-coloured colleague Chas. Hartbeat often attracted 5.4 million viewers and Hart's mailbag varied between 6,000 and 8,000 per week. Richard Deverell, BBC Children's Controller, said: "Tony was a warm man who had an unique ability to communicate with and inspire children. "He was an inspirational man and a terrific broadcaster." Hart received two Bafta awards, won a lifetime achievement award in 1998, and also created the original design for the Blue Peter badge. In an interview last year he said not being able to draw after suffering two strokes was the "greatest cross I have to bear". However, he added: "My aged heart is warmed by the lovely letters and e-mails I receive, especially when they tell me that my work on television inspired the writers to become artists, sometimes very successful ones."